Platinum Supplemental Insurance is one of the most innovative marketers of exclusive supplemental insurance products in the Midwest, offering custom designed products that include Cancer, Heart Attack & Stroke, Long-Term Care and Accident & Disability insurance solutions. Headquartered in Dubuque, Iowa, Platinum's growth is a direct reflection of its commitment to exceed customer expectations with excellent service and affordable products that are underwritten by highly rated companies. In addition, Platinum has proudly held an A+ rating from the Better Business Bureau since 2004 for meeting the bureau's accreditation standards year after year. With a solid fundamental mission to provide the best products and services to their customers, Platinum also invokes a commitment to their representatives and employees with outstanding opportunities for personal, professional and financial growth. 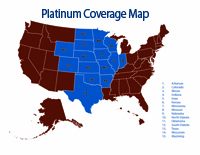 For more information on Platinum Supplemental Insurance, please visit www.pltnm.com.